AzhwAr asks emperumAn whether his protective nature was such that some people could measure it! He says that emperumAn’s desire to protect was much larger than the objects which were to be protected. piRar Ar aRivAr – who can know (other than you)? pirAn un perumai – AzhwAr is wondering at the greatness of emperumAn. He says “One can only doubt whether you know or do not know your own greatness. No one can doubt that others are incapable of knowing your greatness” (is it not true that no one knows!). thaiththirIya upanishath 2-8-9 says “sO angavEdha yadhi vA navEdha” (does he know or not, his own greatness). 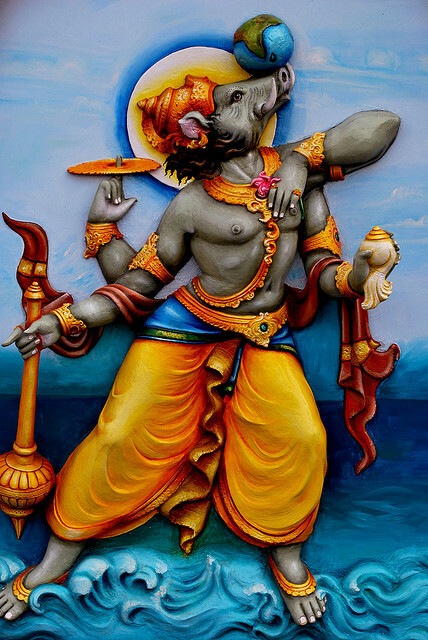 endhai adikkaLavu pOndha padi varAgaththu eyiRRaLavu pOdhAvARu enkolo – the earth, which was sufficiently big for you to measure with your divine foot, became insignificant when you took your incarnation as varAha (wild boar) such that it appeared like a dot on the tusk of the boar. How did this happen? On one day, the earth was big enough, but on another day it was insignificant. How is this! Is it not because your desire to protect the earth is much bigger than that of the protected entity, earth! And, I am fully engrossed in such qualities of yours, says the AzhwAr. We shall take up the 85th pAsuram next. This entry was posted in iyaRpA, mudhal thiruvandhAdhi on September 2, 2017 by T N Krishnan.